Old Brick House. This house is located NW of Tompkinsville near East For Creek on County House Road/ Highway 1366 in the Gamaliel Quad. The original brick house, built around 1805, was the residence of the William Howard Family from North Carolina. Howard owned a great number of slaves which were housed in outbuildings adjacent to the Howard home. Though owning slaves, Howard disapproved of slavery, and he freed each of his slaves eventually. A common hallway joined the outbuildings that the slaved occupied and was connected to the house, but these buildings and hallway have since been destroyed. 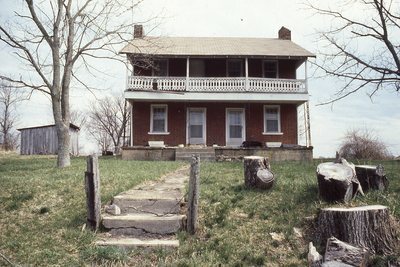 According to Ms. May Taylor, the house, at some time, was used as a tavern as well.